The Guardian’s ‘Why politicians must lie — and how selling ice-creams is like an election campaign’ tells us ‘few expect politicians to tell the truth and few are particularly surprised or affected when lies are exposed’. No wonder Trump has made 8,158 false claims in his first two years in office. India’s Prime Minister Modi, no slouch on such matters, has an impressive record as well and so does the opposition Congress party. Indira Gandhi’s slogan of 1970s ‘Garibi Hathao’ (do away with poverty) indeed being the first of many such false promises. The Guardian talks of how selling ice-cream on a beach where there is already an ice-cream vendor compels the new kid on the block to set up his stall as near as possible to the existing kiosk so that he can poach on customers. Politicians are no different. Stealing the opposition’s ideas is par for the course and so is lying. For example Modi has rewritten the narrative on the ‘Direct Benefit Transfer’ scheme — many believe it was he who single-handedly made it happen. The Guardian also adds ‘most politicians enter politics for ideological reasons. However, the primary game of politics is one of vote winning. You can’t implement your policies if you’re not elected and once elected the most important thing is to be re-elected. So many politicians make this Faustian bargain: They sell their soul to prolong their political careers. They know that the best place to set up their ice-cream stall is right beside their political opponent, with just enough differences to identify them with the other side. They face the choice of openly and honestly standing up for what they believe or maximising their vote. To put it bluntly, they either lie or they lose. How does Indian politics weave in these tactics? The short answer: Extremely well! Lies indeed are at the very centre of campaign strategies in India. Modi’s skills in political gamesmanship, for instance, are unmatched. 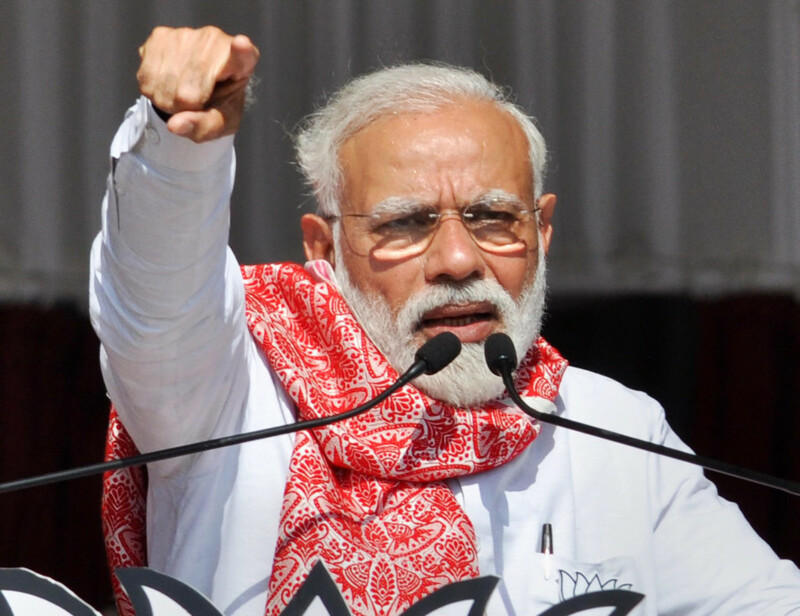 Prime ministers are generally circumspect when they distort facts (leaving the most outrageous lies to party workers), but Modi has no such qualms and a recent exchange between Congress president Rahul Gandhi and Modi should give the reader a feel of how inaccuracies are integral to campaign rhetoric. As the cardinal rule in politics is either lie or lose, a sampling of Modi untruths is in order. Where he stands out, however, is this peculiar proclivity to distort when there is no need to or has only very marginal utility. At a speech to mark the inauguration of the Magenta Line of Delhi Metro, Modi said that former prime minister Atal Bihari Vajpayee became a passenger on India’s first ever Metro service when the Delhi Metro was flagged off in 2002. This is patently untrue, as Delhi Metro was India’s second Metro service after Kolkata. Or during the inauguration of Sikkim’s first airport at Pakyong, Modi said that there are now 100 airports operational in India, of which 35 were added in the last four years. Fact: No more than seven airports were made operational over the last four years. Possibly the speech writer got these dull and commonplace facts wrong, but then it is rumoured about Modi that he doesn’t read from written notes. There is, however, a litany of historical inaccuracies that Modi has uttered over the years. It is intriguing why he should get the name of the Father of the Nation wrong repeatedly — he calls him Mohanlal when even a child knows it is Mohandas. Then he gets his facts wrong on who the chief of the Indian Army was in 1947; gets mixed up between the 1962 War with China and the 1947-48 War with Pakistan; had an embarrassing acronym gaffe in China, getting the spelling of STRENGTH wrong not once but twice! Some of his critics question Modi in a manifestly unfair and wrong way, but I guess in an era where the winner takes all, scurrilous and defamatory statements are the new normal. But opinion polls show Modi is still the most popular politician in India and is likely headed for a second term of office. Ravi Menon is a Dubai-based writer, working on a series of essays on India and on a public service initiative called India Talks.